When and how oxygenic photosynthesis originated remains controversial. 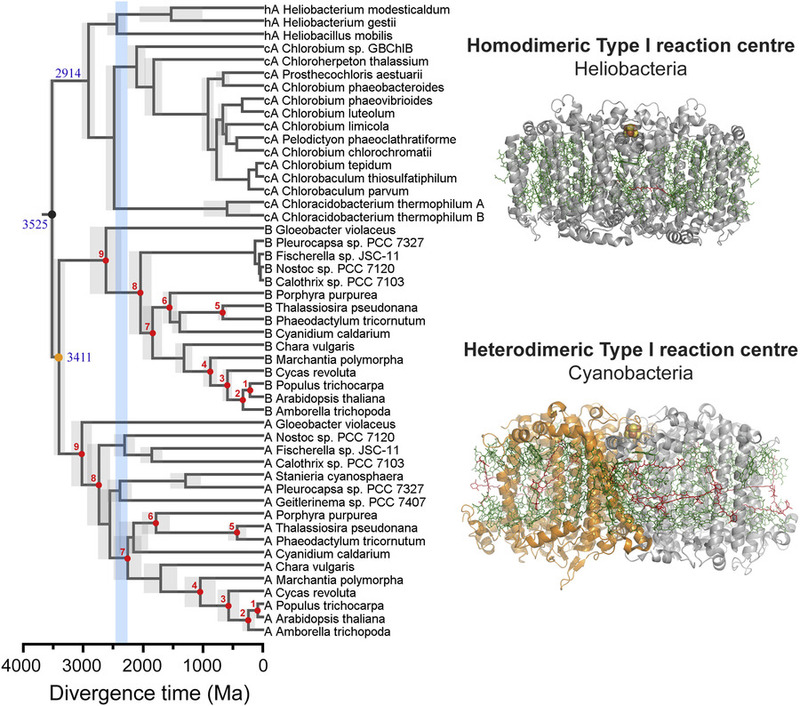 Wide uncertainties exist for the earliest detection of biogenic oxygen in the geochemical record or the origin of water oxidation in ancestral lineages of the phylum Cyanobacteria. A unique trait of oxygenic photosynthesis is that the process uses a Type I reaction centre with a heterodimeric core, also known as Photosystem I, made of two distinct but homologous subunits, PsaA and PsaB. In contrast, all other known Type I reaction centres in anoxygenic phototrophs have a homodimeric core. A compelling hypothesis for the evolution of a heterodimeric Type I reaction centre is that the gene duplication that allowed the divergence of PsaA and PsaB was an adaptation to incorporate photoprotective mechanisms against the formation of reactive oxygen species, therefore occurring after the origin of water oxidation to oxygen. 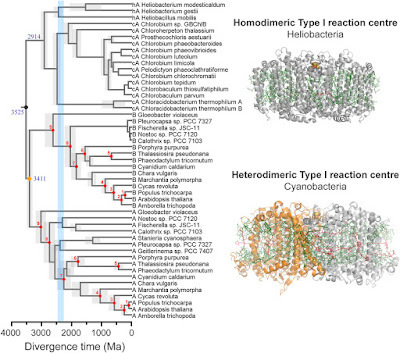 Here I show, using sequence comparisons and Bayesian relaxed molecular clocks that this gene duplication event may have occurred in the early Archean more than 3.4 billion years ago, long before the most recent common ancestor of crown group Cyanobacteria and the Great Oxidation Event. If the origin of water oxidation predated this gene duplication event, then that would place primordial forms of oxygenic photosynthesis at a very early stage in the evolutionary history of life.